TEMPLE—The Army Marathon and Half Marathon can’t seem to catch a break. Last year, the runners endured freezing temps, ferocious north winds with sleet and rain. On Sunday, it was more of the same. Although it wasn’t as cold or nearly as windy as last year, the 1400 runners (evenly divided between the marathon and the half) were prepared this year with plenty of cold-weather gear. And they needed it. A persistent mist/drizzle blew all morning and with temps hovering in the mid-30s, it made for a chilly route for the marathoners on a point-to-point course from Killeen to Temple and the half marathoners on an out-and-back course from Temple. The weather issues of the third installment of the Army Marathon were certainly unavoidable, but the race had another issue: Buses. The marathon got off right on time just as a downpour hit Killeen. The half started on time as well, but at least half of the field missed the 7 start. Instead, many of the half marathoners were lined up in the rain for more than a half hour in a parking lot at Scott & White in Temple waiting for a short bus ride to the start. But there were too few buses and by the time many of the soaked half marathoners and 5-K runners reached the start, the half had already begun. Some half marathoners set off on their own as soon as they arrived at the start, while others waited in the rain to get sent off at a hastily rearranged secondary start at 7:30 along with the 5-K runners. Big winners of the day of this military-themed race were Matt Buchhorn of Sherman and Ruel Sword of Waco who were the overall winners of the marathon. Buchhorn, the track coach at Austin College, ran the first 15 miles along with Matt Curtis of Waxahachie, but soon after that surged and left Curtis. By the time Buchhorn reached Belton Lake with around eight miles left, he had disappeared into the mist and the race was essentially over. Following Sword was Stephanie Magnus (3:32) and Patricia Sonn (3:34:47). Christine Westcott was the first masters woman (3:40:04) with Stephanie Boulette second (3:44:44) and Nancy Nichols third (3:44:51). The top grand master woman was Judy Shipway in 5:27:21. The half marathon was dominated by Michael Kurvach. who got to the starting line on time, and ran all by his lonesome out to Belton Lake and back to Temple to win in 1:15:56. Doug Teed was second in 1:22:14 and John Craft was third in 1:29:56. Doug Saltmarsh, a 50-year-old who recently moved to Austin from Maine, was fourth in 1:30:18 and the first master runner of the morning. Gary Scott was the second masters guy in 1:37:01 and Wish was third in 1:42:30. Saltmarsh finished right in front of Ginger Stoker of Austin, who was the first woman in the half in 1:30:48. 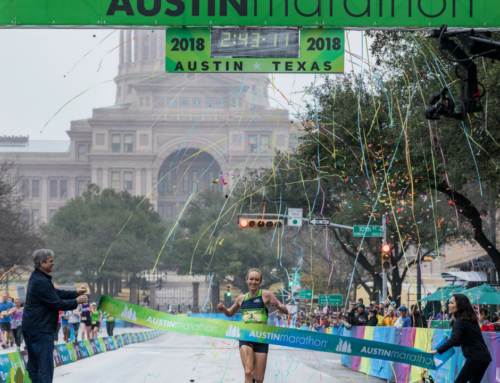 Stoker and Anne Hughes had left Austin at 4:30 that morning, driven up I-35 through the downpour and wavered several times whether they should even run. Another Austinite—Lisa Buckley—was second in 1:31:42 and Samantha Wassel was third in 1:34:46. Anne Hughes was the first masters woman in 1:39:37 with Guadalupe Sanchez second in 1:40:36.